Brussels (VNA) – National Assembly Chairwoman Nguyen Thi Kim Ngan and President of the European Commission Jean-Claude Juncker agreed that the signing and ratification of the EU-Vietnam Free Trade Agreement (EVFTA) should be sped up for mutual benefits, during their meeting in Brussels on April 4 (local time). Ngan said Vietnam has been improving legal regulations in line with international law and commitments that Vietnam has signed and involved, including the EVFTA. The country listened to opinions and learnt from experience of developed countries in the promulgation and execution of law, she added. In the process of law-building, the Vietnamese NA has worked to ensure the business and investment rights of domestic and foreign enterprises are not affected, she said. The legislature also closely supervised the implementation of issued laws to ensure no barriers cause difficulties for people and businesses to exercise their investment rights. The two sides have organised a number of workshops to discuss matters of different perceptions, she said, adding that Vietnam is willing to provide relevant information that the EC is interested in. 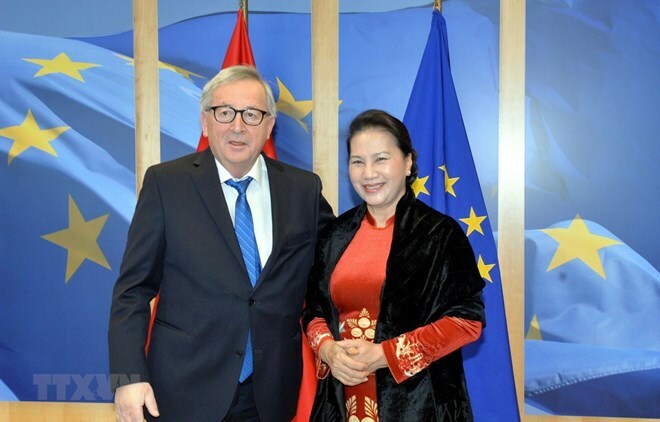 President Jean-Claude Juncker spoke highly of the socio-economic development of Vietnam over the past years. He said he has signed and sent the EVFTA to the European Council, which will be later submitted to the European Parliament (EP).